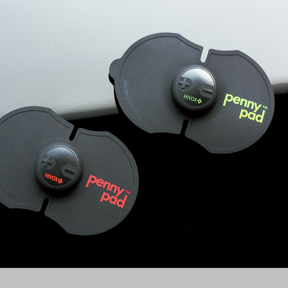 Blending the concept of a pain-relief patch and an electric stimulator, the pennypad™ offers a natural method of relieving pain by cutting off the pain gate and helping induce endorphins. All components are integrated in a small core device, and built-in target-oriented programs provide different types of relief for such conditions as general pain, menstrual pain, neck and shoulder pain, and low-back pain. Credits: Designer: Mr. David Tuan and Design Team: HIVOX BIOTEK INC.